The Green Arrow is finally recruiting members for a new Team Arrow, but his training methods come across harsh and untrustworthy. Meanwhile, Oliver has a new project to complete as mayor while investigating several attacks in Star City. I'm thrilled to see new faces on Arrow this season. I think Oliver definitely works best when he has a team behind him. 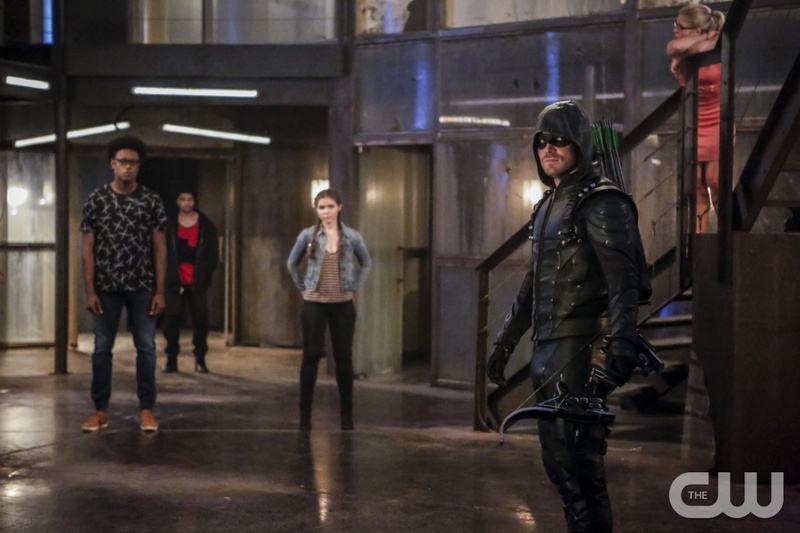 While the training didn't go that well (mainly because Oliver + people = failure), the end of the episode was exciting because we got to see the team come back together and hopefully move forward. Curtis was a gem, as always, and I'm grateful he's around to reveal to Oliver what's not working. (Also him trying to exercise like Oliver was hilarious.) There wasn't a lot to Evelyn Sharp yet, but I'm looking forward to her development as a character. Wild Dog is interesting--he definitely has guts and passion; I can't wait to watch Oliver shape him into a better hero. The flashbacks for Russia in this episode had a nice connection to Oliver's training in the present day. A+ script writing. This is so much better than last season's, which felt so distant from what was happening in Star City. Although I still have reservations about Felicity's character this season, I'm grateful she's the one sticking around for Oliver. She's the one who can set Oliver straight and let him know truths he can't always see. Oliver probably would have failed long ago if it weren't Felicity backing him up. Plus, she has a great jokes. I never thought I would like Thea's character; for a long time, she bothered me. But this season, she's grown into a better character--a character that can organize Oliver, do reconnaissance without being on Team Arrow, and help out Quentin. Honestly, I love that she's looking out for Quentin. I still think Thea should just take over as mayor. How can I express my intrigue for this new character? I can't. At first, I was a little shocked when he killed the representative of Amer-Tek, but once his purpose (and face) was revealed, I was stoked. I want him to join Team Arrow because he's got magical cloth powers and he actually gets stuff done. (Also his connection to Havenrock, the place that got nuked last season, is definitely going to be interesting.) So please come back! While I'm glad Diggle isn't completely off the show and that he is doing what he feels is best, I'm not very interested (right now) in his story. He left Oliver, so I'm a little bitter. And while his mission connects to the nukes from season four, I just don't care. Bring Diggle back to Star City. Then I'll care. I don't like him. At all. Nope. Get out. Overall, this episode was intriguing. I'm eagerly looking forward to what happens next! What did you think of "The Recruits"?